The biggest news out of any media outlet is the hubbub that has arisen from plans of a mosque being constructed within eyesight of Ground Zero, where over 3000 people died in attacks on the World Trade Center by Muslim extremists. Americans are up in arms about the idea of something so close to such hallowed ground, that it is a slap in the face for those who died and sacrificed themselves to help out in this tragedy. Then again, so was not passing health care for people involved with 9/11 and are now having serious health problems. But whatever. Glenn Beck said that the proposed mosque isn’t just a mosque, but a statement: you wouldn’t build a Christian megachurch in the middle of Saudi Arabia, or in the middle of Utah, unless you were trying to make a statement. This would be all fine and dandy, except what a lot of people aren’t getting is that the mosque isn’t going to be blatantly put in everyone’s face. In fact, there is already a mosque sitting within eyesight of Ground Zero that has been there before the World Trade Center even existed, and yet no one is holding rallies to shut it down. The heart of the problem, as much as I hate to say it, is a misconception about both the circumstances of the mosque, and also of Islam in general. Doing any preliminary research, one would know that it is a mosque inside of a cultural learning center. The center is probably so close to Ground Zero to make a statement, with the statement being that while, yes, is was Islamic extremists that flew the planes into the towers and killed so many people, there is more to Islam than blowing things up. Which brings us to the second problem: misunderstanding the Muslim faith. It’s a phenomena called Islamophobia, and it works much the same as homophobia or arachnophobia; you find someone that practices Islam, you project your prejudices upon that person, and then you fear or hate them. There is no doubt that the events of 9/11 completely shook up the world. There is also no doubt that there is some lingering fear from the 9/11 attacks, and no one is exactly sure who to trust. But blocking someone from building a house of worship, no matter where it is being built, is just wrong, especially when it is a belief system that you don’t agree with. Another pundit made the point that there is a church near the Alfred P. Murrah Federal Building in Oklahoma City, the same building that Timothy McVeigh, a Christian, bombed. Where is the uproar? Where is the incredulity? Where is the call to arms to shut down this church for the sake of the victims involved? All I’m asking for is a little consistency, something that seems to be lacking in this day and age. Either we need to go back to every terror attack site, and eliminate all houses of worship related to the attackers, or we can take a deep breath, and look at this new building for what it’s worth: a chance for people to better know a thing they fear so greatly. It’s human nature to want to blame someone for the problems of the world. From the impoverished to the wealthy, there is always someone to blame for all of the wrongs in your life. Some people blame their parents for not raising them right, other people blame teachers or professors that they’ve had for not nurturing them as well as they should have. Still others blame God, because if God was truly watching out for God’s creation, then bad things would never happen to good people. The latest in this trend goes toward politicians, and their trying to assign blame to a certain administration for certain terrible things that are happening to the country. It’s no secret that I believe that all politicians are children who never grew up, but this awkward, off-the-wall blame game that’s happening is extremely frustrating. Take, for example, this video from the 29 June episode of the Daily Show. In it, Jon Stewart, with all of his wit and tact, shows different Fox News analysts and reporters blaming everything bad during the Bush administration, as well as part of the Obama administration, on the Clinton administration. Bad economy, 9/11, invasion of Iraq, the housing crisis, and the oil spill are all the fault of Bill Clinton. The biggest problem I see with this whole debacle is that there is no reason to blame President Clinton for most of that stuff. Sure, there are some ties between Clinton and 9/11, in that he probably got some memos warning about a possible attack. But President Bush probably also received those memos as part of a “Welcome to Being President” package upon moving into the White House. I know that the new President gets all sorts of bomb codes and different secrets like that. Surely some memos of national security are bound to be included. And while I could mention something hypocritical in the way that Fox News says, “Don’t Blame Bush” while simultaneously saying, “It’s Clinton’s Fault,” I’m not even going to touch that. It’s way too easy, and happens far too often. Instead, why not focus on the real problem: the lack of personal responsibility. It a problem that reaches into all demographics of the world. No one wants to be the one that screwed it all up, so if they can think of a scapegoat, or can find someone else to share blame with, then they aren’t as bad as other people would think. It’s a tactic that is meant to keep up a cognitive bias known as Illusory Superiority, which is essentially the belief that people have that they are above average, even when everything else shows that they are not. Fox News didn’t want Bush to be the worst President in history, so they blamed everything on Clinton, making Clinton the bad guy, and keeping Bush above average. 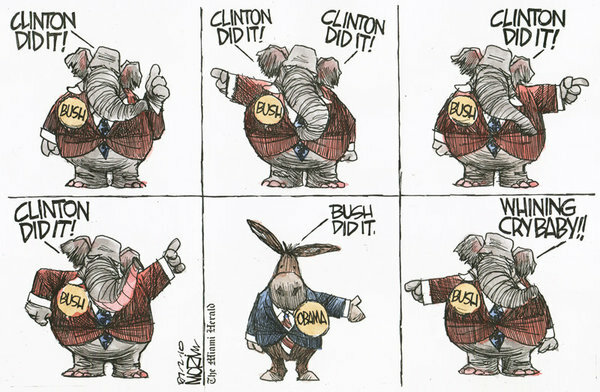 Fox News and conservatives can blame Clinton all they want, and they can shout down the Obama administration for “blaming Bush” for all of the bad things in the Obama Presidency, but the bottom line is: blame will fall where it is most justified. Any ill that comes from the wars in Iraq and Afghanistan will be Bush’s fault, because it was his decision to go to war, not Clinton’s. The BP oil spill will be partly Bush’s fault, because he passed legislation that allowed oil companies doing off-shore drilling to use lower standards, but it will also be Obama’s fault because the clean up effort is a mess, and not enough is being done to have BP take responsibility. Every President is going to have some things that are obviously their fault. Everything that happened after 9/11 in Bush’s presidency is Bush’s fault, because the honeymoon was over, and Clinton’s scent was far removed from the Oval Office. And I’m stating this for the record: everything that happens after this oil spill is going to be Obama’s fault, because it’s been over a year since he took office. But the bottom line is: someone has to step up and say, “Yeah, that was me. Sorry. I screwed up.” Playing the blame game will only go so far before people stop listening and start making their own conclusions. Osama bin Laden: Old News? Think back eight years, to September 11, 2001. Think of the fear that was instilled in you when you saw the first plane hit the towers. When you saw the huge fireball flash across the sky, raining debris down on the people below. Think back to when news organizations started showing video of earlier in the day, when the people in the top floors had no choice but to jump. Think of the emotions that ran through your mind as you tried to wrap your head around the complex issues and moral questions that they had to wrestle with–that they were wrestling with–as they fell to the ground below. Think of the fear that struck your heart when the towers collapsed, and those 3000 people, representing hundreds of nations of the world, would never be heard from again. Think of the anger that coursed through your veins when you heard the name Osama bin Laden, the man responsible for all of this terror. Now, bring yourself to Christmas Day, 2009, and Umar Farouk Abdulmutallab’s failed attempt at bombing an airliner by sewing explosives into his underwear. Born in Nigeria, recruited to al Quaeda in Yemen, and flying into Detroit. Think of the emotions you felt. I wasn’t sure what to feel, because the whole thing seemed ridiculous to me, as I’m sure it did for most of you, too. It was a ludicrous idea that failed, as was probably expected, but no one wanted to believe. Emotions not as strong as that fateful day in September, but still pretty strong. The questions were thrown around: where was Obama? What does this mean for airport security? What does this mean for the safety of the United States citizens? One questions that was definitely not in anyone’s mind: where is Osama bin Laden? Here he is, over a month later, taking credit for the attack, even though it failed. What are the emotions running through your mind? What are you feeling? Are you angry? Scared? Confused? Osama bin Laden, I think, has been largely forgotten, only coming into the limelight every so often with a new tape with the same old shtick of “Death to America” and “Allah Akbar”. And even then, it’s been a while since he released a tape. The last reference I can find to a bin Laden tape before this one was back in 2006. He’s been gone from our minds, and hasn’t really been perceived as a threat in a long while, and taking credit for a ridiculous and failed terrorist attack. I sort of feel like bin Laden is doing the same thing. He wants to be the feared al Quaeda leader he once was, so he’s going to take credit for anything remotely terror related. He wants attention, he wants to be the name that people remember until the end of time, but frankly, he isn’t that frightening anymore. Not to condone terrorism, but if bin Laden truly wants to be feared, something spectacular has to be done. 9/11, even with all the grief and anguish that came from it, was spectacular. To have small groups of people working in sync to hijack four planes and crash them into three buildings. It takes years of planning, communicating, and organizing to get something like that together. And who’s to say that bin Laden isn’t planning something like that? Bottom line, bin Laden is a hack. He’s still the guy that staged the worst terror attack on American soil, but he hasn’t done anything really worthwhile since. The question is: is it time that we quit focusing on bin Laden, and rather focus on things of more importance?